Brothers and Sisters was at once the career peak and the first step into the abyss for The Allman Brothers Band. It was released in the wake of dual tragedies, a year apart, which took the lives of two founding members and saw the emergence of another founding member as the group’s primary driver. On the upside, this album served as the band’s commercial peak while still maintaining much of the quality blend which brought the band to critical prominence in earlier years. On the downside, this success marked the beginning of an era of celebrity which saw the band drift away from its music-centric approach of their earliest albums and start to produce “country-fried hit records and egos that ripped them all apart”, as drummer Butch Trucks would later state. Like with the group’s previous album, Eat a Peach, a member of the band died while the band was in the process of recording, resulting in an album where the member only played on select tracks. In the previous case, the victim was lead guitarist Duane Allman, who offered much to that double LP but was completely absent from this one. Bassist Berry Oakley played on the first two tracks of Brothers and Sisters before he was tragically killed on November 11, 1972 from injuries he sustained in a motorcycle accident. Oakley declined medical treatment at the scene, thinking he was alright, but three hours later he was rushed to the hospital due to extreme pain, and died of cerebral swelling caused by a fractured skull. Ironically, Oakley’s accident in Macon, Georgia was just three blocks from where Duane Allman had his fatal motorcycle accident the year before and both had died of head injuries. Lamar Williams replaced Oakley on bass for the remainder of the album’s session. More than any other group member, guitarist Dickey Betts stepped into the leadership role and shines brightest on this album, composing five of the seven tracks and maintaining guitar excellence throughout. Betts and Allman had established a harmonized guitar repertoire during the band’s early years, with Betts’ country flavored style contrasting perfectly with Allman’s blues/jazz fusion style. Following the death of Duane Allman, Betts stepped up to be the group’s sole guitarist, furiously practicing the slide guitar methods in order to cover the majority of Duane Allman’s parts. Led by Betts, the band put together a light but enjoyable album with a crisp sound which melts their unique style of rock with doses of country, blues, and borderline funk. Gregg Allman‘s “Wasted Words” opens the album as a perfect “outlaw country” tune with Betts’s guitar riffs mocking the vocal melody and accompanied by a nice honky tonk piano, making for an upbeat introduction to Brothers and Sisters. “Ramblin’ Man” is, by far, the most popular song on this album and the only Top Ten of the band’s career. It would be the most typical of country/rock songs if not for the fantastic guitars throughout by Betts who composed and sings lead on the track. Still, the song has rarely been performed live due its rigid structure not allowing for much improvisation, a must in the band’s concert performances. the recording was also the final track to feature Oakley. “Come and Go Blues” is a nice break in the action from all the country and Gregg Allman’s finest moment on the album. This moderate funk jam contains great piano which drives the verse music and later comes to the forefront with a lead and a counter-riff during the intense final verse. The drumming and percussion by the dual of Trucks and Jaimoe and Butch Trucks is exceptional on this really cool track. The sides are bookmarked by a couple of live-sounding blues jams which sound like they could have been cut from the same session. “Jelly Jelly”, written by songwriter and producer Trade Martin, is the more forgettable of the two, not terrible but too overtly bluesy for a complex band like the Allmans. “Southbound” contains a little more funk but is rather mediocre compared to the band’s better material. The instrumental “Jessica” is Betts’s finest moment on record, led by the three-part harmonized signature riff where the guitarist is joined by Allman on Hammond organ and Chuck Leavell on Fender Rhodes electric piano. Levell later plays piano during an intense long middle part, which also includes a further great lead section by Betts. One of the more focused jams in rock history, this song is really one last look back at the monumental music which built this band. The opening acoustic guitar is played by Les Dudek and the song is named for Betts then two-year-old daughter. “Pony Boy” starts as pure southern blues before morphing into a bluegrass beat. Sung by Betts who provides slide acoustic guitar and is accompanied by piano and upbeat country drum beat in a great, scaled down jam that provides a fitting conclusion to the album. 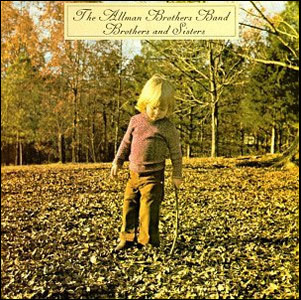 Brothers and Sisters five weeks at #1 on the U.S. albums chart and made The Allman Brothers Band one of the top concert draws in the country. However, personality conflicts started to tear the band apart and future releases suffered with the band never again reaching this level of critical or commercial prominence.